Tiyana was referred to me by Tamela who is part of the wedding team at Word of Faith Love Center. 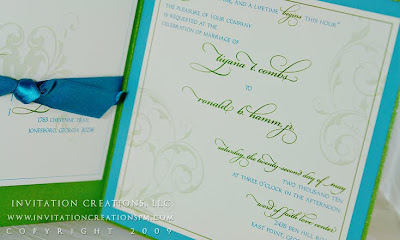 Tiyana saw this sample I had created for another bride and loved it. My other bride had chosen another design so in essence this is the first time I had used this design for a bride. 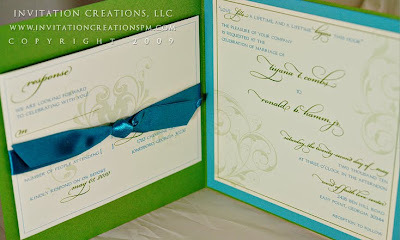 Her colors were green and blue and it worked so well with this design!!! I loved how it came out. on the left was the response postcard which was tied and held by a matching ribbon! 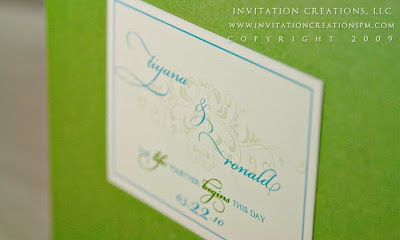 Such a great invitation and I love these colors!